Dr. Carrine A. Burns was raised in Northport, NY. She graduated with distinction from Cornell University in 1994, with a B.S. in Biology. She attended medical school at the University of Virginia, and after graduating in 1998 moved to Maine to complete a family practice residency at Maine Medical Center. In 2001 she returned to NY for a residency in dermatology at the University of Rochester, where she also completed her Mohs surgery fellowship. 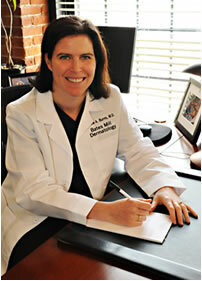 She practiced in Portland for several years before joining her husband at Bates Mill Dermatology in 2011. Her practice focuses on skin cancer and skin surgery. Dr. Burns is a diplomate of the American Board of Dermatology, a Fellow of the American Academy of Dermatology, a Fellow of the American College of Mohs Surgery, and a member of Alpha Omega Alpha (medical honor society). Dr. Burns and Dr. Bouman live in Freeport with their two daughters. Copyright © 2013 Bates Mill Dermatology. All Rights Reserved.